This summer, my mother and I had the honor of visiting my great-great grandmother’s grave. There were no stones placed on her gravestone as no one has visited her since 1942. It was a beautiful cemetery that has been slowly restored by a non-Jewish local woman named Riva Vaivos. We met RiVa at the cemetery and I asked her why she is spending countless hours by herself in the Jewish cemetery restoring and hand painting each headstone… her response was, “because there are no Jews left to do this.” The cemetery is illuminated with color. Riva hand paints the Hebrew letters on each headstone in a rainbow of colors telling me that she is fulfilling OUR tradition. While restoring, she sometimes she scrapes off 7-8 layers of paint. Risa Gittel Freyman’s stone is in a cemetery in Jurbarkas, Lithuania adjacent to the town’s mass murder site where the remainder of her family is buried in the mass grave. 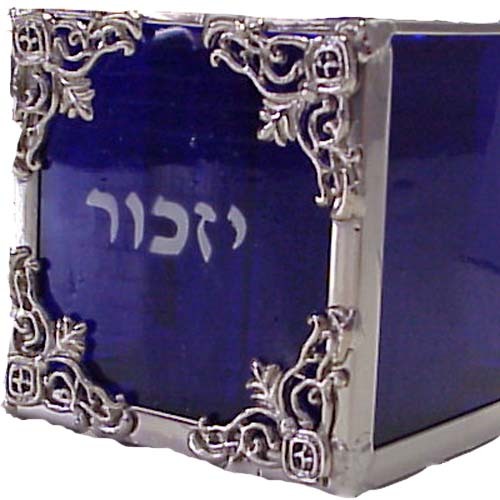 My mother and I had brought our blue Temple Chai Yizkor book and said Kaddish for her and for everyone around us who haven’t had Kaddish read for them in 70 years. We also said Kaddish in the Jewish cemeteries of Vysokie Mazalowieki and Chee-cha-novitz, Poland where my grandfather’s family are likely buried. I say likely because Jewish headstones were frequently taken and used for building materials such as foundation walls and wheels after the Jews were gone. There are no caretakers there and the headstones are going back to becoming field stones. There are less than 5,000 Jews in the entire country of Lithuania. Over 96% were liquidated during WWII. One thing that struck me while in Poland and Lithuania was that the majority of people we met at Jewish sites caring for our cemeteries and synagogues were not Jews. Similar to angel in the Jurbarkas cemetery, our guide at Auschwitz was not Jewish, nor was our guide on the Jewish Quarter/Schindler Factory tour, nor the head of Matzevah in Lithuania, nor was our researcher in Poland, nor the man who cares for the only wooden synagogue standing in Lithuania. They all said that there are no Jews to do this. I hope ‘out of sight out of mind” will not become our American Jewish “norm”. It was an honor to visit Lithuania and Poland. I hope I can pass on the family legacy and to continue the Yizkor tradition of remembering so our family will be able to visit a grave and know others were there to visit and honor them too. Let’s also remember those generations cut short with no one left to leave a stone for them. Wonderful. Everyone should enjoy your speech and travel log. Keep us posted on how it went. Mimi & Art PS next you’ll be writing a book….. Your words are beautiful. I have seen the book of pictures, what a wonderful memory to be passed on for future generations. lovely.. you gave me chills.